Carlos Argelis Gomez Pena…he and his wife Gerandy reside in Santiago, DR, in the offseason with their sons Yandel and Yadiel...attended the Rangers' 2017 Awards Dinner and Fan Fest…graduated from Ana FA Jimenez High School in Santiago, Dominican Republic...was signed by Mets scout Eddy Toledo at age 16 in July 2002. Combined to bat .231 (95-411) with 13 HR, 53 RBI, and 18 steals in 118 games with the Astros and Rangers...had his lowest batting average and fewest hits since 2011 (.225 AVG/52 H)…hit .241 vs. LHP and .228 vs. RHP…had a .202 (34-168) average in 51 road games…batted .396 (21-53) in 14 interleague games, 8th highest in the majors (50+ PA)… was 6-for-13, including 2 homers, with the bases loaded…had a .991 (2 E/234 TC) in 111 total games in the outfield with 7 assists, all with HOU. Played in 115 combined games between Houston (41g) and Milwaukee (74g), batting .255 (111x435) with 29 doubles, one triple, 12 homers, 56 RBI and 17 stolen bases...hit .242 (36x149) with nine doubles, four homers, 10 steals and 13 RBI in his 41 games with the Astros (38 starts in center ﬁeld)...made his eighth career Opening Day roster and start...played in eight games with Milwaukee before getting placed on the15-day Disabled List with a right hamstring strain on April 17 (retroactive to April 16)...injured the hamstring while running to ﬁrst base on April 15 at STL...was activated from the DL on May 2...traded to Houston on July 30...battled intercostal discomfort for the Astros ﬁnal 20 regular season games, playing in just three games (one start)...made his ﬁrst career appearance in the inﬁeld on April 10, moving to second base after Scooter Gennett was ejected...added two leadoﬀ homers to his ledger, belting leadoﬀ shots on May 18 at DET and May 29 vs. ARI, giving him nine career leadoﬀ homers...played in his 1,000th Major League game on May 26 vs. SF...scored his 500th career run on July 2 at PHI...hit his ﬁrst career grand slam on July 3 vs.CIN, tying a career-high with ﬁve RBI...hit his 100th career home run on Aug. 4 at TEX...recorded an extra-base hit in ﬁve straight games from Sept. 6-11...was tied for the second-longest streak by an Astro in 2015 with Jason Castro, behind Jose Altuve's six-game run...pinch-ran in the 8th inning on Sept. 28 vs. TEX...stole second base and then scored on a passed ball, giving Houston an insurance run in their 4-2 win over the division-rival Rangers...in his last start of the season on Sept. 30 at SEA, went 2x4 with a run scored and two steals...executed a game-ending double play by catching a line drive by Franklin Gutierrez and doubling up James Jones at ﬁrst base...was his 13th career multi-hit, multi-steal game, and his ﬁrst since Aug. 2, 2014 at STL...played in ﬁve of Houston's six postseason games, making four starts in center ﬁeld...went 4x15 (.267) with two homers and three RBI...homered in Game 4 of the ALDS vs. KC and the Wild Card Game at NYY...hit.307 (23x75) with six doubles, four homers, eight RBI, ﬁve steals and a .900 OPS (.354 OBP/.547 SLG) over his ﬁnal 24 games combined between the regular season and postseason...was acquired by Houston from Milwaukee along with RHP Mike Fiers and slot number 76 in the 2015-16 international pool in exchange for LHP Josh Hader, RHP Adrian Houser, OF Brett Phillips and OF Domingo Santana. Signed a 3-year contract extension on 3/13 which runs through the 2016 season...Enjoyed his best Major League season as he batted .284 with 24 HR, 73 RBI and 40 stolen bases in 147 games to finish ninth in National League Most Valuable Player voting...Made 143 starts, all in center field...Was named Brewers Most Valuable Player as voted on by members of the Milwaukee Chapter of the Baseball Writers Association of America...Led the team in doubles (27), home runs (24), extra-base hits (61), total bases (271) and slugging percentage (.506).....tied Norichika Aoki for the team lead in runs (80) and Jean Segura for the team lead in triples (10)...Ranked among the National League leaders in triples (T2nd, 10), stolen bases (4th, 40), slugging percentage (7th, .506) and extra-base hits (T8th, 61)...Was the only player in the Major Leagues in 2013 with 20+ home runs and 35+ stolen bases...Became the first player in franchise history to produce 20+ home runs and 40+ stolen bases in a single season...Won his first Rawlings Gold Glove Award, snapping the team's streak of 30 consecutive seasons without a winner, the longest drought in the history of the award (since 1957).....was the first Brewers Gold Glove Award winner since Robin Yount won at shortstop in 1982...His 12 assists trailed only the Mets' Juan Lagares (14) for the Major League lead among center fielders...Was selected to his first All-Star Game.....joined Davey May (1973) as the only center fielders in franchise history to make an All-Star team.....went 0-for-1 in the All-Star Game as he played three innings in right field.....grounded out off the Yankees' Mariano Rivera...Was named National League Player of the Week for 4/15-4/21 after batting .500 (9-for-18) with 2 HR, 3 RBI and 5 runs in 6 games...Recorded his 500th career hit on 4/21 vs. Chicago-NL with a single off Scott Feldman...From 4/23-5/8 produced a career-high 14-game hitting streak (26-53, .491, 4hr, 9rbi), the longest by a Brewer in 2013...Notched his first career 2-homer game on 5/25 vs. Pittsburgh.....duplicated the feat two days later with a pair of homers vs. Minnesota...On 9/26 was suspended for a game for his actions while rounding the bases on a home run on 9/25 at Atlanta.....served the suspension on 9/26 at New York-NL. Batted .260 with 19 HR, 51 RBI and 37 stolen bases in 137 games. Made 98 starts, all in center ﬁeld. His .260 batting average, 19 HR and 37 stolen bases marked career highs. Tied for ﬁfth in the National League in stolen bases (37). Batted .281 (66-for-235, 14hr, 33rbi) over his last 67 games to raise his batting average from .233 to his season-ending .260. Was one of ﬁve players in the Major Leagues with 15+ HR and 30+ SB in 2012, joining teammate Ryan Braun, the Angels' Mike Trout, Rays' B.J. Upton and Phillies' Jimmy Rollins. Belted his ﬁrst career pinch-hit homer on 4/24 vs. Houston with a solo shot off Brett Myers. Was on the 15-day disabled list from 5/6-5/19 with a strained left hamstring, retroactive to 5/5 ... suffered the injury on 5/4 at San Francisco while running the bases. Appeared in 4 games at Class-A Wisconsin during a rehab assignment from 5/16-5/19. Was named National League Co-Player of the Week for 7/23-7/29, batting .346 (9-for-26) with 4 HR and 10 RBI ... shared the honor with the Reds' Drew Stubbs. Signed a 1-year contract on 1/17/13, avoiding arbitration. Was selected to the Dominican Republic provisional roster for the 2013 World Baseball Classic. Batted .225 with 8 HR, 24 RBI and 16 stolen bases in 94 games...Made 59 starts, all in center field...His 8 HR marked a career high...Did not commit an error the entire season...Homered on Opening Day for the second consecutive season as he followed Rickie Weeks' leadoff homer on 3/31 at Cincinnati.....the two became the first teammates since the Reds' Pete Rose and Bobby Tolan (4/7/69 vs. LA) to lead off a season with consecutive home runs...Hit first career inside-the-park homer on 5/28 vs. San Francisco (solo off Jonathan Sanchez)...Was on the 15-day disabled list from 7/21-8/31 with a fractured left clavicle.....suffered the injury while making a catch on 7/20 at Arizona...Underwent surgery on his left clavicle on 7/25.....surgery was performed by Dr. William Raasch...Appeared in 4 games at Class-A Wisconsin during a rehab assignment from 8/27-8/31...Batted .357 (5-for-14) with 1 HR and 2 RBI in 8 games during the postseason...Scored the game-winning run in Game 5 of the NLDS on 10/7 vs. Arizona on an RBI-single in the 10th inning by Nyjer Morgan.....Gomez, who entered the game on defense in the eighth inning, produced a 1-out single in the 10th and stole second base before scoring...Played for Aguilas in the Dominican Winter League...Signed a 1-year contract on 1/10/12, avoiding arbitration. Batted .247 with 5 HR, 24 RBI and 18 stolen bases in 97 games during his first season withthe Brewers...Made 67 starts (66g in CF, 1g in RF)...Led the team in stolen bases (18)...Led Brewers position players with 6 sacrifice bunts, trailing only pitcher Chris Narveson (7)for the overall team lead...Became the third player in franchise history with 4 hits in his debut with the team as he went4-for-5 with 2R, a double, solo homer and stolen base on Opening Day vs. Colorado.....joinedChuck Carr (4/2/96 at California) and Felipe Lopez (7/20/09 at Pittsburgh) as the only Brewersto accomplish the feat...Was on the 15-day disabled list from 5/11-5/20 with a strained left rotator cuff (retroactive to5/6).....was injured diving back to a base on 5/5 at Los Angeles...Was also on the 15-day disabled list from 8/6-8/23 with a concussion (retroactive to 8/3).....was hit by a Brian Schlitter pitch on 8/2 at Chicago-NL...Appeared in 22 games (8 starts) after coming off the disabled list for the second time, batting.356 (16-for-45, 2rbi, 8sb)...Following the season played for Escogido in the Dominican Winter League...Signed a 1-year contract on 12/17, avoiding arbitration. Batted .229 with 3 HR, 28 RBI and 14 stolen bases in 137 games with Minnesota...Made 86 starts, all in center field...Committed just one error the entire season (8/5 at Cle)...Produced a career-high 5 RBI in a 13-7 win on 7/12 vs.Chicago-AL...Scored the game-winning run in the bottom of the 12th inning of the Twins' American League Central tie-breakergame on 10/6 vs. Detroit...Made his only appearance of the postseason in Game 2 of the ALDS vs. New York...started in center field andwent 0-for-4 with a run, walk and a hit by pitch...Following the season played for Escogido in the Dominican Winter League...Was traded to Milwaukee for SS J.J. Hardy on 11/6...Signed a one-year contract on 1/19/10, avoiding arbitration. Hit safely in nine of the first 10 games to start the season, going 14-for-43 (.326), March 31-April 11...hit first career leadoff home run, April 24 at Oakland...had first career four-hit game, second career leadoff home run and became the first Twin to hit for the cycle since Kirby Puckett (August 1, 1988), May 7 at Chicago (AL)...second career four-hit game, May 22 vs. Texas...had third career four-hit game, May 29 at Kansas City...had career-high 12-game hit-streak, going 14-for-54 (.259), May 31-June 11...was 8-for-17 (.471) in four games, June 30-July 2...went 3-for-3 with two runs scored, July 29 vs. Chicago (AL)...had three straight two-hit games, August 21-23 at Los Angeles (AL)...named American League Co-Player of the Week for the week of September 8-14, batting .333 (7-for-21) with two doubles, a triple and 10 rbi, driving in at least one run in each of his games during the week...he compiled a .524 slugging percentage along with a .360 on-base percentage...it marked Gomez' first career weekly award...stole his 30th base September 10 vs. Kansas City, becoming just the seventh different Twins player to record 30-or-more steals in a season...tied his career-high with four hits on September 25 vs. Chicago (AL), with two triples and a double...set the Twins single season record for bunt base hits with 30...led the Majors in bunt singles (30) and trailed only Ichiro Suzuki (52) in infield hits (50)...Gomez was just one of 12 players in the Majors to record 30 steals and have at least 30 extra-base hits. Activated from the 60-Day Disabled List on September 7th...Saw action that night vs. Houston...Went 0-1 and played centerfield...It was his first game since July 4th...Placed on the 15-Day Disabled List on July 5th with a fracture of the hook of the hamate bone of his left hand...Mets Team PhysicianDr. Straun Coleman along with Dr. Michelle Carlson removed the fractured part of the hamate bone at the Hospital for SpecialSurgery...Transferred to the 60-Day DL on August 18th...Played in five rehab games with St. Lucie (A) of the Florida State League...Hit .154 (2-13) with one walk and four strikeouts...Tied his career-high with three hits, June 24th vs. Oakland...Also had three hits, June 16th at Yankee Stadium...Hit his first major league home run, a three-run shot, on June 10th at Detroit (Jason Grilli)...The three RBI were a career-high...Collected his first big league RBI on May 16th vs. Chicago...Recorded his first major league hit, a double, off Chris Capuano on May 13th vs. Milwaukee...Also had his first stolen base in thatcontest...Made his major league debut with a start in rightfield on May 13th vs. Milwaukee...Was 2-4 with a double, two runs scored and astolen base in that game...The last major league player as young as Carlos (21 years, 160 days) to get at least two hits and at leastone steal in his major league debut was Delino DeShields (21 years, 84 days), who had four hits and one stolen base for the Exposon Opening Day in 1990...Was recalled from New Orleans (AAA) of the Pacific Coast League on May 13th...Was hitting .286 (40-140) with 24 runs, eight doubles,two triples, two home runs, 13 RBI, with 15 walks and 17 stolen bases in 36 games...Was leading the PCL in stolen bases atthe time of his recall. Was the co-winner of the Sterling Award emblematic of the Most Valuable Player on his Binghamton (AA) team...Shared the award with teammate Michel Abreu...Finished second in the Eastern League in stolen bases and fifth in triples...Put together an 18-game hitting streak from July 6-July 25 (30-68, .441)...In 27 games in July, he posted a .406 (41-101) batting average with nine doubles, four triples, two home runs, 12 RBI and 14 stolen bases...Compiled a .294 average (30-102) in 30 games in August with 18 RBI and 14 stolen bases...Was hitting .221 (47-213) after the games of June 30...Batted .341 (74-217) the rest of the season to bring his average up to its final mark of .281...Hit .421 (40-95) with men in scoring position...Also hit .341 (15-44) with runners in scoring position and two outs and was 56-171 (.327) with runners on base...Had 34 multiple-hit games on the year: 28 contests with two hits and six games with three hits...Stole two bases in a game eight times...Batted .200 (4-20) with five runs scored for Leones del Escogido in the Dominican Winter League. Named to the South Atlantic League All-Star team...Led the League in stolen bases and was second among all minor league players...Won the Sterling Award, emblematic of the top player on his Hagerstown (A) team. Split the season between Rookie Kingsport and the Rookie GCLMets and batted .281 with 1 HR, 31 RBI and 17 stolen bases in57 games. Spent his first pro season in the Dominican Summer League. March 7, 2019 New York Mets signed free agent OF Carlos Gomez to a minor league contract and invited him to spring training. 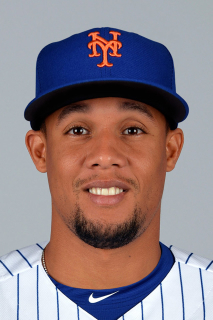 March 7, 2019 OF Carlos Gomez assigned to Syracuse Mets. October 29, 2018 RF Carlos Gomez elected free agency. May 26, 2018 Tampa Bay Rays activated RF Carlos Gomez. May 16, 2018 Tampa Bay Rays placed RF Carlos Gomez on the 10-day disabled list. Strained right groin. March 3, 2018 Tampa Bay Rays signed free agent RF Carlos Gomez. November 2, 2017 CF Carlos Gomez elected free agency. August 26, 2017 Texas Rangers activated CF Carlos Gomez from the 10-day disabled list. August 19, 2017 Texas Rangers placed CF Carlos Gomez on the 10-day disabled list retroactive to August 16, 2017. Excision of cyst behind right shoulder. June 16, 2017 Texas Rangers activated CF Carlos Gomez from the 10-day disabled list. June 14, 2017 Texas Rangers sent CF Carlos Gomez on a rehab assignment to Frisco RoughRiders. June 10, 2017 Texas Rangers sent CF Carlos Gomez on a rehab assignment to Round Rock Express. May 16, 2017 Texas Rangers placed CF Carlos Gomez on the 10-day disabled list retroactive to May 15, 2017. Strained right hamstring. December 13, 2016 Texas Rangers signed free agent CF Carlos Gomez. November 3, 2016 CF Carlos Gomez elected free agency. August 25, 2016 Texas Rangers selected the contract of CF Carlos Gomez from Round Rock Express. August 21, 2016 Carlos Gomez assigned to Round Rock Express. August 20, 2016 Texas Rangers signed free agent CF Carlos Gomez to a minor league contract. August 18, 2016 Houston Astros released CF Carlos Gomez. August 10, 2016 Houston Astros designated CF Carlos Gomez for assignment. May 31, 2016 Houston Astros activated CF Carlos Gomez from the 15-day disabled list. May 24, 2016 Houston Astros sent OF Carlos Gomez on a rehab assignment to Corpus Christi Hooks. July 31, 2015 Houston Astros activated CF Carlos Gomez. May 2, 2015 Milwaukee Brewers activated CF Carlos Gomez from the 15-day disabled list. September 27, 2013 Milwaukee Brewers activated CF Carlos Gomez. September 26, 2013 CF Carlos Gomez roster status changed by Milwaukee Brewers. May 20, 2012 Milwaukee Brewers activated CF Carlos Gomez from the 15-day disabled list. May 16, 2012 sent CF Carlos Gomez on a rehab assignment to Wisconsin Timber Rattlers. May 6, 2012 Milwaukee Brewers placed CF Carlos Gomez on the 15-day disabled list retroactive to May 5, 2012. Strained left hamstring. November 10, 2011 OF Carlos Gomez assigned to Aguilas Cibaenas. September 1, 2011 Milwaukee Brewers activated CF Carlos Gomez from the 15-day disabled list. August 27, 2011 sent CF Carlos Gomez on a rehab assignment to Wisconsin Timber Rattlers. July 21, 2011 Milwaukee Brewers placed CF Carlos Gomez on the 15-day disabled list. Fractured left clavicle. October 22, 2010 CF Carlos Gomez assigned to Leones del Escogido. August 24, 2010 Milwaukee Brewers activated CF Carlos Gomez from the 15-day disabled list. August 13, 2010 sent CF Carlos Gomez on a rehab assignment to Nashville Sounds. August 6, 2010 Milwaukee Brewers placed CF Carlos Gomez on the 15-day disabled list retroactive to August 3, 2010. Concussion. May 21, 2010 Milwaukee Brewers activated CF Carlos Gomez from the 15-day disabled list. May 19, 2010 sent CF Carlos Gomez on a rehab assignment to Wisconsin Timber Rattlers. May 11, 2010 Milwaukee Brewers placed CF Carlos Gomez on the 15-day disabled list retroactive to May 6, 2010. Strained left rotator cuff. November 6, 2009 Milwaukee Brewers traded SS J.J. Hardy to Minnesota Twins for CF Carlos Gomez.